A gallery of wildlife photography showing some of the wonderful and diverse species that live in Ireland and the UK. 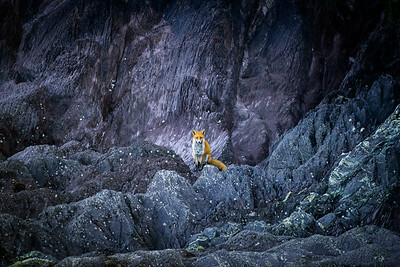 Whilst out for an evening coastal walk in late Spring I was lucky enough to spot this beautiful red fox foraging along a beach amongst purple and turquoise-hued rocks. As I watched and photographed it from a good distance it would frequently pause to sit and observe me in return. This particular shot is my favourite from the encounter; the fox is sitting as obediently as a well-trained pet dog and the shades of purple and blue remind me of astronomical photos of distant galaxies with the scattered white limpets creating the effect of stars! The photograph was taken near Ballycotton in County Cork, Ireland. An Irish red squirrel foraging amongst leaves on the forest floor, seeking out stashes of food left in preparation for the Winter months. 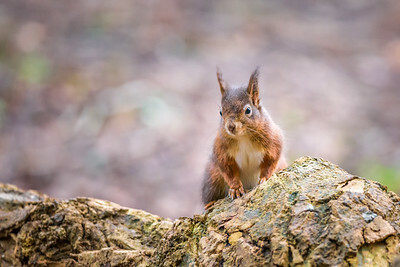 The squirrel was photographed in Fota Wildlife Park in County Cork, Ireland. Although the park contains more exotic species such as cheetah, Sumatran Tiger and Indian Rhino a good number of opportunistic native Irish species make it their home too. 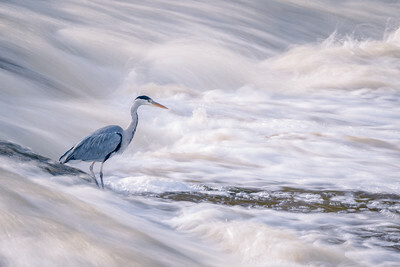 A grey heron stands waiting patiently for unsuspecting prey whilst the river rushes by. Photographed on the River Blackwater in Fermoy, County Cork. 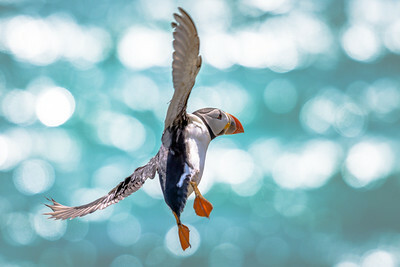 An Atlantic puffin launches itself into the air heading back out to sea in search of food. The photograph was taken in the Summer on Great Saltee Island in County Wexford in Ireland. The island is a haven for wildlife including fulmar, gannet, shag, kittiwake, guillemot, razorbill, puffin and grey seal. 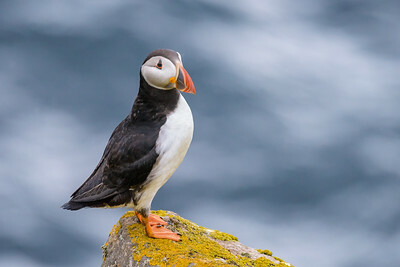 An Atlantic puffin set against the deep-blue backdrop of the Celtic Sea. The photograph was taken in the Summer on Great Saltee Island in County Wexford in Ireland. The island is a haven for wildlife including fulmar, gannet, shag, kittiwake, guillemot, razorbill, puffin and grey seal. A red squirrel resting amongst the branches of a fallen tree. 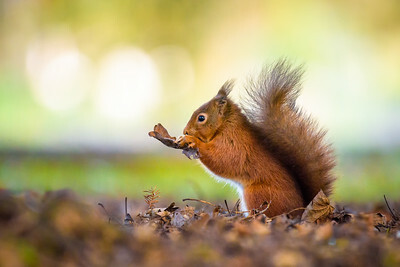 This photograph was taken in the pine forest at the beautiful National Trust reserve at Formby near Liverpool in England, one of the few remaining red squirrel locations left in England. The reserve also contains miles of sand dunes and beach walks. I have to admit this photo was set-up with the aid of some peanuts, but the first visitor to the stump was a peckish robin... the squirrel only obliged with this perfect pose when it noticed the robin! I think this photo shows how getting down on the ground at the animal's level can produce a much more pleasing composition; even if it's not good for the lower back it can be worth it. 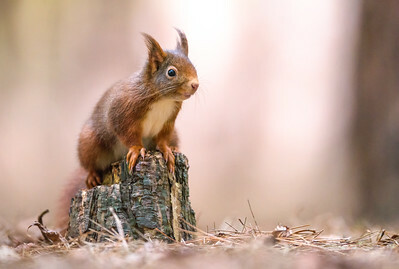 The photograph was taken in the pine forest at the beautiful National Trust reserve at Formby near Liverpool in England, one of the few remaining red squirrel locations left in England. The reserve also contains miles of sand dunes and beach walks. 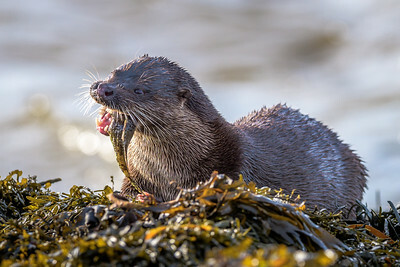 Despite being in decline in many countries, Ireland is still somewhat of a stronghold for the Eurasian Otter and although notoriously difficult to view, you can occasionally get lucky and see them in daylight, particularly on coastal shores. This otter was photographed on a Winter's afternoon on a stretch of coastline near Kinsale in County Cork. It was approaching high-tide when I spotted the otter quite far out, swimming parallel to the shore and occasionally lying on its back to eat small morsels. I followed it's direction for a while and at each dive I positioned myself on the rocks just in case it decided to come in with a larger catch. I thought the chances would be very slim but eventually it swam right towards me with a larger fish in its mouth and proceeded to eat it for a full 5 minutes! I was incredibly fortunate to see it at such close-quarters and especially that it stayed in full view facing towards me as it finished off the fish! 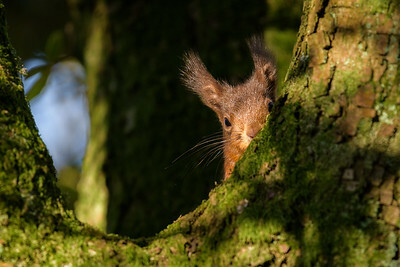 A vigilant red squirrel maintaining a watchful eye. The photograph was taken in Fota Wildlife Park in County Cork, Ireland. Although the park contains more exotic species such as cheetah, Sumatran Tiger and Indian Rhino a good number of opportunistic native Irish species make it their home too.